Purchasing beanbag chairs can be considered a great method available to quickly and easily dress up your home and even a commercial space. They can be used in your children’s rooms, living room, family room, basement, and even for your pets. They can be used in hospitals, offices, schools, libraries...anywhere people, especially kids, tend to need comfortable seating for long periods of time. It's an surefire way to invite visitors to stay awhile. Beanbag chairs can easily be stored in a closet when you need more space inside the room, or stacked when not in use. They are an all-around very practical furniture choice for most environments. With that said, you need to pay attention when selecting the right one in order to get the best use out of it. Cloth beanbags are usually preferred because they offer skin-friendly textures and more decorating styles, but in this article I want to talk about vinyl beanbags. Some people find that vinyl can be sticky and not skin-friendly (not to mention often shiny), as compared to a cloth or woven fabrics. In warm weather, since vinyl is doesn't breathe, getting sweaty can be a problem. However, vinyl-made beanbags are easy to wipe and clean without having to take off the cover to wash in the washing machine. If you decide to purchase a vinyl-made chair, you need to make sure that the fabric uses lead free, non-toxic dyes. As most beanbags come from overseas such as China, knowing the chemical makeup can be difficult. Try researching the manufacturer by calling the Consumer Products Safety Commission, the Toy Industry Association, and the Better Business Bureau, they can then point you in the right direction to get more information on the company. There should also be a law label tag sewn into the cover telling you manufacturer information such as company name, address, and a Uniform Registry Number. 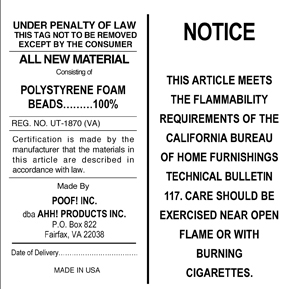 If you don't see this law label, don't buy that beanbag! Look for additional information on care tags inside the cover if you can get the cover off. The best choice of course is Made in America products where you can track down information easily and you know there are safety guidelines and laws in place. You can also contact companies that offer bean bags and ask questions. Ahh! Products at 888-244-6818 will answer any product question, even if it's not about their own stuff. Even with waterproof beanbags, It is better to buy one that has a liner, so that the cover can be removed and washed periodically to be sanitized, but vinyl ones rarely come with liners since the covers should be water-tight and don't require a liner to protect the filling from liquid spills. You can also clean with anti-bacterial wipes to cut down on germs, particularly in commercial environments. You need to purchase high quality ones to ensure durability because vinyl beanbags in particular are vulnerable to wear and tear as they are pulled and pushed in all directions. Why is vinyl more vulnerable than woven cloth? When something is sewn, the needle pokes holes in the material. In woven cloth, those holes are already there for the most part (look closely at any cloth fabric and you'll see a mesh-like weave). Vinyl, in comparison, has no holes - which makes it waterproof. That means a needle must puncture the vinyl and make hundreds if not thousands of little holes along the seams. As vinyl beanbag chairs are used, and pressure is put on the seams, those little holes will start to expand and the seams get tugged on. Cloth fabric allows for more expansion and "give". Eventually, the holes poked into the vinyl will get weaker and wider until the seam breaks. Then, sadly, you get leaking filling all over the place. Vinyl beanbags are notorious for leaking! That means you need to have at least double-stitched seams and by all means...get a warranty in writing! Expect to get no warranty like in big box and discount stores; and sadly, even the "better" brands that cost a lot don't come with warranties. In this case, make sure to understand the return policy for defective items. Breaking seams should not be considered wear and tear. You can find beanbags at stores like www.ahhprods.com where they offer a 10 year warranty on materials and workmanship defects because they know their bean bags won't break since they are sewn properly. (Ahh! Products doesn't offer in-stock vinyl styles, but they do offer an affordable custom ordering program where you can send in vinyl or request a quote to have a vinyl beanbag made just for your needs, plus they give you that 10 year warranty mentioned earlier). As for the zippers, they need to be locked to ensure the safety of your children. Leaking filling can be inhaled and cause suffocation in extreme cases. Most vinyl beanbag manufacturers will disable the zipper altogether, but that means you cannot refill it if it goes flat with use (filling tends to compress with use). Look for a zipper that is child-resistant, which means it can be opened with a tool and the knowledge of how to unlock it, but will not open just by pulling on it. Usually these child-resistant zippers will not have a pull-tab. To test, insert a paperclip leg into the zipper head and make a pull-tab. Pull to release and unzip it. If it won't open, that means the manufacturer has permanently disabled it (by putting glue on it for example). Again, remember that these un-open-able ones cannot be refilled when they go flat, so factor that into your decision (it's best to get a refillable one so you can use it for years instead of just months). Beanbag chairs are available in different sizes. Make sure you select the one that best suits ALL your needs. Remember that even though you may be buying one for your child and he's currently only a few feet tall, he will grow and the bean bag needs to accommodate a toddler all the way up to an adult (assuming you get a beanbag that is high enough quality to last many, many years - like the ones that offer a 10 year warranty). Also, pets tend to love them and will often take them over - so if you allow Fido to use it, get a size that will accommodate him, too. That goes for Mom, Dad, and siblings - everyone eventually will gravitate to a comfortable seat at some point! Choose something that is at least 3 feet wide (113 inches around in circumference), unless you are willing to upgrade the size later because you prefer a smaller footprint now. When you are looking to purchase a beanbag, you need to think about the filling as well. Look for a high quality polystyrene (Styrofoam) filler to ensure that the beanbag sits and feels like a traditional bean bag. Make sure to ask the manufacturer, or just look inside if possible, if the filling only consists of polystyrene and not any other material. Unfortunately, some are filled with all sorts of trash! Believe it or not, even needles have been discovered inside poor quality bags! Polystyrene fill is often considered the best fill because it is soft enough to provide great comfort, but gives support. Polyurethane, shredded couch cushion foam, tends to be more "pillow-y", and doesn't have the same level of push-back support. Shredded polyurethane foam also can be specially treated with flame retardant chemicals, while polystyrene Styrofoam generally is not and thus has less potentially toxic off-gassing. For more information about styrene versus urethane: http://www.ahhprods.com/bean-bag-chairs/bean-bags-vs-sacs-styrofoam-beads-vs-shredded-foam/. Polystyrene Styrofoam will compress with use, so expect your bean bag to get flatter with use. This cannot be avoided if you want the support and feel and should not be considered a defect. Compressed filling is never covered under warranty. Good beanbags will allow you to refill with more filler to plump it back up. Great companies like Ahh! Products will give their product owners a discount on filling. 1. Decide if you need a waterproof beanbag. If not, consider a cloth-covered one for superior style and softer texture choices. 2 If vinyl is the best choice, select ones colored with lead-free, non-toxic vinyl dyes. 3. Research the product to understand how safe it is by contacting the manufacturer if possible, get information from any attached labels and the CPSC, Better Business Bureau, and Toy Industry Association - especially if not Made in USA. CPSC will provide recall information. BBB will offer any complaints on file. Toy Association will help you with manufacturer contacts. 4. Get a liner if possible so you can sanitize the cover periodically. Or, at least use anti-bacterial wipes. 5. Look for the longest term warranty possible, to cover workmanship and materials for defects. Broken seams are NOT normal wear and tear. If there's no warranty, understand the defect refund/return policy. 6. Choose only zippers that won't open easily. The best are child-resistant ones that will lock and unlock with a simple tool, so you can access the filling but kids cannot. 7. Choose a size that will accommodate everyone in the family, and get one that your child can use after he has grown bigger, at least 3 feet wide, unless you plan on getting a bigger size later. 8. Choose polystyrene (Styrofoam) filling for the best support and to avoid unnecessary flame retardant chemicals. Make sure the filling doesn't contain any trash, but only the Styrofoam. Yes, some are filled with all sorts of unwanted things! Once you've selected the right one for you, sit back and enjoy! Do you have any tips for bean bag shoppers? I'd love to hear them!